There’s just something about ancient standing stones and beautiful landscapes that lend themselves well to black and white art prints. And don’t you think this gorgeous Ancient Irish landscape in Count Kerry qualifies? This is the sort of scenic place that would be dramatic no matter what. Add some great winter light and a Neolithic standing stone and it has dramatic beauty in spades. I’m given to understand there are other standing stones like this in the area although I only encountered this one lone stone. These stones are collectively known as Clogher Head Megaliths. The meaning to the people who erected them is long lost with them, but it’s still pretty amazing to stand before one of these neolithic stones and try to fathom those ancient minds. What did they believe? What did this ancient Irish landscape mean to them? Clearly this little corner of County Kerry was a special place to some group of people a long time ago. I was told while visiting this area that this corner of Ireland is especially popular with artists. While all of Ireland was beyond my expectations, this was definitely an area that I could understand how any visual artist could come here and become so enchanted that they never left. And maybe that same beauty explains in some part the long-ago people who built their enduring monuments in this ancient Irish landscape. Have you had the happy experience of travelling the Ring of Kerry? Did you happen upon these ancient standing stones in a dramatic coastal landscape? 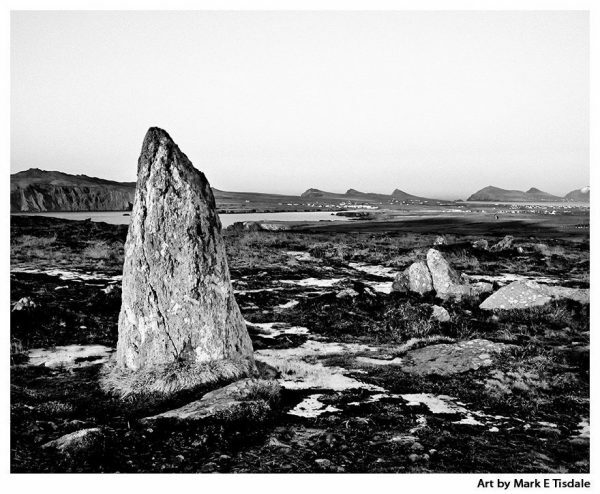 Perhaps you simply love prints of ancient and mysterious standing stones? I’d love to hear how this County Kerry art print speaks to you?